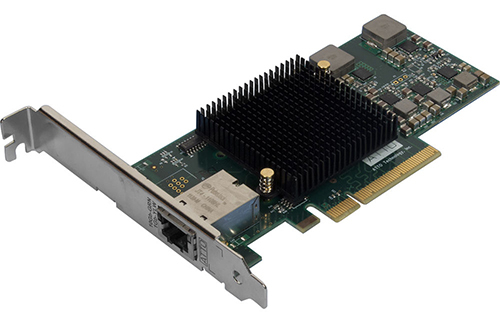 Use up to 30% less power while taking advantage of ATTO Technology's proprietary Advanced Data Streaming (ADS) latency management for smoother streaming and reduced risk of dropped frames with FastFrame 10Gb Ethernet network interface cards (NICs). FastFrame 10GbE NICs simplify networking administration, integrate seamlessly into existing environments and reduce the total cost of ownership by improving connection bandwidth and eliminating redundant network infrastructure components. FastFrame NICs provide the most flexible and scalable connectivity solutions for today's data center environments. Connect clients to servers, clients, to NAS; and by leveraging support for iSCSI initiators, support for connecting into iSCSI storage area networks (SANs). ATTO engineers FastFrame NICs for stable, near-line-speed data rates across broad range of file sizes for predicatable network performance while minimizing CPU utilization. With FastFrame, single-chip integration results in lower power utiltization with a low-profile form factor, in single- and dual-port configurations. FastFrame draws up to 30% less power than competing solutions. 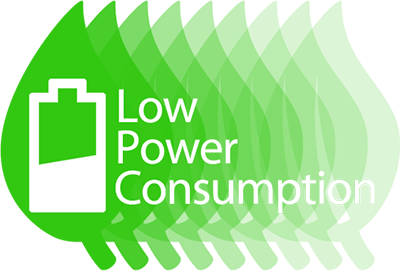 A lower power rating means lower energy costs, lower data center maintenance fees and less heat to dissipate. Long committed to the Apple market, ATTO leads in high-performance I/O connectivity for macOS environments. 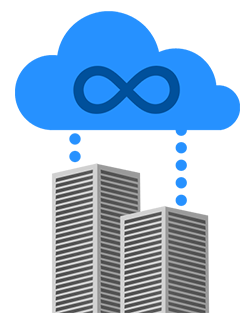 ATTO also offers Xtend SAN, an iSCI initiator for macOS, to complete the solution. Acquire your NICs for multiple OS environments from a single source - one familiar with the data-intensive demands of content editing. Based on industry-standard Ethernet technology, ATTO FastFrame NICs are available in single, dual, and quad-port configurations. FastFrame has been proven to deliver high performance I/O connectivity and lossless Ethernet support for improved iSCSI block storage access as well as optimal network traffic. ATTO FastFrame NICs make it possible to setup virtual networks across campus or the data center. Using optical fiber and a transceiver (SFP+), Ethernet packets can now travel up to 400m without sacrificing speed or data quality. ATTO FastFrame NICs provide the most flexible and scalable connectivity for today's data center environments. By leveraging data center bridging and support for software iSCSI initiators, FastFrame network adapters offer the ability to support both local and storage area networks. Meet the demands of 6K Today. Migrate to higher performance levels with FastFrame 40GbE and 10GbE NICs. FastFrame is used for demanding applications using streaming media like post production and video/sound editing, and other rich media and data intensive applications. Data transfers just got faster. ATTO 40GbE NICs feature industry-leading latency management with RoCE. It has the benefit of eliminating the intermediate step of utilizing the CPU to transfer data and enabling near line-rate performance. Sometimes it is not just how fast you move the data, but how well you can manage the flow of that data to reduce network collisions. With distinctive latency-management features such as ATTO Advanced Data Streaming (ADS), FastFrame adapters deliver better overall performance across all of your applications while reducing your CPU utilization significantly. 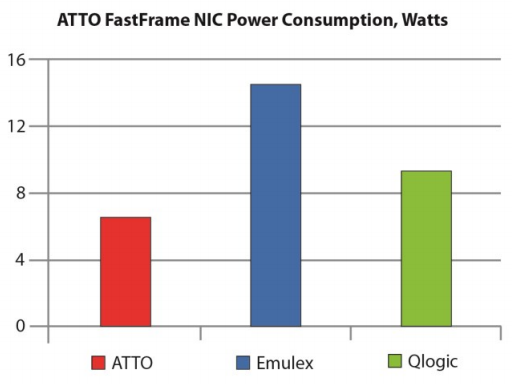 ATTO FastFrame NICs are the lowest energy consuming cards on the market and provide a higher ROI by transferring more data per dollar spent on power than the competition. One 40GbE NIC can do the same amount of work as four 10GbE cards with less power consumption and overhead. ATTO FastFrame NICs work wherever you need them: in workstations, servers, and data center racked servers. They are supported by a full suite of software drivers for macOS, Windows and multiple Linux distributions.